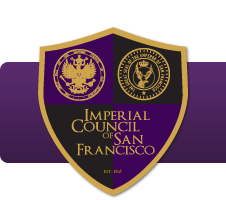 The Imperial Council of San Francisco, Inc. is a not-for-profit 501(c)(3) Public Benefit Corporation in the State of California that hosts and participates in a variety of entertainment and educational events, and activities to raise monies, which support the causes of other diverse community-based charitable organizations that do not discriminate based upon race, age, gender, sexual orientation, religion or ethnic background. Our purpose is to collect charitable contributions from individuals and organizations, to distribute those contributions to other not-for-profit 501(c)(3) public benefit charitable organizations, and to have fun while doing it. Our intent is to allow membership to any individual or organization. Though our primary membership is drawn from the LGBT culture we believe everyone has the right of inclusion and the desire to help their community.